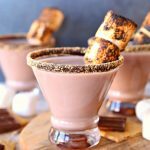 Turn your favorite summer treat into a delicious cocktail with this toasted s’more martini cocktail recipe. Dip the rim of a martini glass into chocolate syrup, then into the crushed graham crackers. Pour liquid ingredients into a shaker with ice, and shake until mixed well. Pour mix from shaker into glass. Garnish with toasted marshmallows. Marshmallows can be broiled in the oven to roast multiple marshmallows at one time. Double and triple recipe to make multiple martinis at a time.